The standard (read "easiest, because Steve doesn't have rock shoes") west face route is pretty well described in Secor's book, but it's not clear that "a point between the summit of Cathedral and its west peak Eichorn Pinnacle" actually means the saddle between them. Further, the route from there could be clarified to say "Traverse from the saddle across NW facing ledges to the highest notch, just south of the summit block." It's second class up to the saddle, third class to the notch, and 15' or less of fourth class. The base of the west face can be approached from Budd Creek or the John Muir Trail because the north shoulder is class 2 up to about 10300'. Now the REAL trip begins! A night at Mono Meadows trailhead (complete with dozens of deer crashing around in the dark, dogs barking, people setting up tents by car headlights, etc) was followed by a short backpack to the base of Mt Starr King (9092). Crossing Illilouette Creek was mid-thigh wading with good footing. We camped 50 yards from the trail junction just south of the peak, where a little stream provided a good filter-clogging test. No bugs so far - it was hot and dry. Leaving the trail at this junction, we traversed north to the stream which drains the SW face of Starr King. There was minor brush, but nothing like other reports we've read, indicating our indirect trail route might be better. Stay on the ridge south of the drainage, then traverse north into the SE of the two saddles. Secor says to climb to the first saddle south of the peak, the NW saddle, but it looked a lot easier to do the second (SE) saddle and romp over the middle summit: this keeps it second class all the way to the roped pitch. 5.0, you say? Nope. Many register entries confirm our impression that it was more like 5.4 - doable in vibram soles, but only with a top belay (Karon and I both slipped at the same spot, where the angle and friction are such that rock shoes are required for any degree of safety when leading). The prominant rap sling on "the big ledge" is NOT at the halfway point. You can't reach the top on a single rope from here! Go straight up to a smaller ledge, then go left: the alternate of left-then-up leads you under an overhang. Just above the smaller ledge is another rap sling (old and fading) held in place by a stone chock. From here you can reach the top but you may not be able to rappel all the way to the saddle, even if you bring two ropes to rap off! Macho climbers will walk down the 4th class friction of the top pitch, we all used the rope. Sunday, Karon packed out (generously carrying both ropes and the rack!) while Tim and I packed on up the Illilouette toward Ottoway Lake. Bugs were bad between 8k and 9k, but Ottoway was amazingly free of pests. It was also amazingly beautiful! Clear deep blue water, big trees, big fish, and only one tent on the far side. We reluctantly continued on to Upper Ottoway, thinking it was too late in the day to attempt a peak and hoping to find a higher campsite. Rising water in the late afternoon melt-off forced us to move the tent, but we found a cool campsite which featured views of the sun setting below the lower lake AND city lights (Merced? Modesto?) after dark. Climbing Red Peak (11699) from Ottoway, one should NOT go to Red Peak Pass as Secor suggests. If you do, you will have to drop over 100' as you traverse around the SW around the gendarmes that appear to be the face of the peak (they are not). This is a loose traverse. It's better if you leave the trail just before the first switchback, and go straight up the talus toward the peak (staying west of the gendarmes). Red Peak is a pile of shoebox sized loose red rocks. Ugly. It does have some sheer cliffs (on the side you don't see with this approach) but the footing is relentlessly terrible and the view is mediocre. To reach Gray Peak (11573) from Red, we dropped to the NW saddle and then down to the lakes at 10400. 3 hours into the day and we're back at our camp elevation! This is a beautiful valley, with slabs and tundra and plenty of water. Secor's description of Gray Peak talks about a 3rd class ridge, but that's not necessary from any direction. 50' below ridge, on the north side, it's good class 2. The entire SW face is also class 2, either frictioning up the slabs or picking through large loose talus, and there are many places to cross the ridge if you top out at the wrong spot. The 7.5' topo seems to have a mistake, and Secor is silent about which end of the ridge is the true summit. Visually the west bump is higher, but the map shows an extra contour line and labels the east end. My altimeter showed the west bump to be 30' higher, and that's where the register is found. Go figure. Gray has much better views of Clark and surrounding valleys than Red, and the footing is better. Unfortunately for us, we had to go within 200' of Red's summit to get back to camp! Sigh. More tedious shoebox hopping. From the same place we should have left the trail for Red, I took off for a giant traverse above Upper Ottoway Lake and below Ottoway Peak to the saddle north of Merced Peak (11726). Tim headed back to camp to get some work done and rest up for the trudge out. Popping over the 10800' shoulder north of the lake, I climbed above each cliff or gorge and hit no major obstacles while angling up to the saddle. This high traverse does not look good from below, but works very well (at least with some snow here and there). The slabs don't offer much friction and in my rush to beat the sunset I took one 15' screamer, sliding down the rock as in a standing glissade, when I hit a polished area. From the saddle to the summit of Merced is fine class 2 with your choice of huge boulders, smaller rocks, a knife edge, or a face. Merced has by far the best view and the best footing. No one had been on the peak since last fall. I was alone on the summit from 5pm to 6pm, soaking up the beauty and peaceful isolation after a long day. 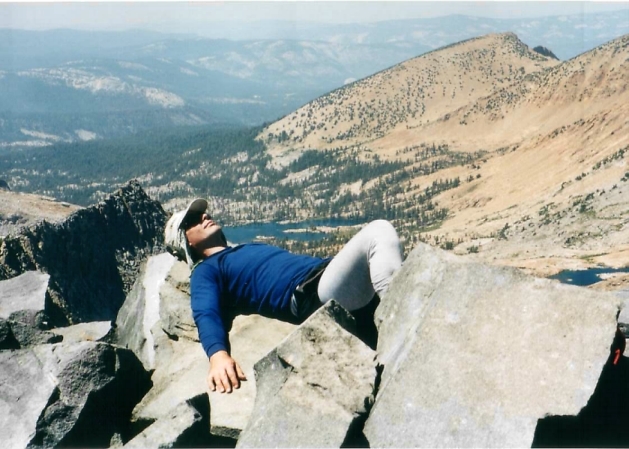 I took a nap, read the old registers, gazed across to the eastern Sierra (Ritter and the Minarets, maybe a thunderstorm over Whitney), studied the granite valleys around Gale and Sing to the south, admired the scooped south face of Clark to the north, and generally recharged myself in the warm breeze that pushed small puffy clouds around the sky. If you've never been on a good peak by yourself, be safe but make sure you spend enough time to capture the feeling of being where there is no sign of mankind and no sound but the whistle of air through a bird's feathers. An all-snow traverse under the north side of Merced's west ridge led me back to camp in under an hour. On rock this might take twice as long, because the few rock bands sticking out of the snow were big and loose boulders. In camp, after 11 hours of climbing and 1 hour of napping, I was surprised to find the waist belt removed from my pack - this velcro attachment is hard to peel off, and must be done in several steps to avoid ripping the fabric, but there it was! Tim's almost full backpack had been turned over and moved from where he left it, and it had a greasy stain on the top. We assume a wayward bear plowed through camp but found only bear-proof cannisters and packs open for inspection. There was no damage, making a marmot attack seem unlikely (they usually chew for salt). Just before dark the mosquitoes hit, and they stayed with us in varying degrees until we got below 8000' the next day. They've hatched! Take a head net! Take full body bug suits if you want to take rest breaks! We took about 7 hours for the 17 mile pack out to the car, getting back just in time for Tim to make an (unwashed?) appearance at the monthly PCS meeting where he was showing slides from Chile. The clouds were building fast as we drove away from Yosemite, and we got to see lightning strikes bright enough to draw attention away from the motorhome lumbering slowly down our sunlit roadway. Did we dodge the rain bullet again, or is El Ninny actually being kind to us? Tune in for the next climb!